this trademark restriction does not form part of this License. 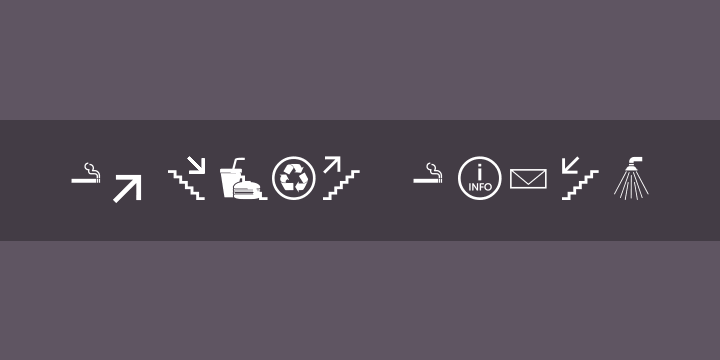 From the website: In this free collection I have added common used symbol signs for public services such as Toilets, Telephone, First Aid, Elevator, Information, Restaurant, Coffee Shop, Smoking, Baby, Recycle Icon, Shower, Reception desk, Arrows collection and much, much more. The symbol signs can be used for restaurant signage, hotel signage, office wayfinding, airport signage and more. The complete symbol collection is optimized for reproduction methods such as engraving, laser engraving/cutting, screen printing and self adhesive film to manufacture the signs you need.